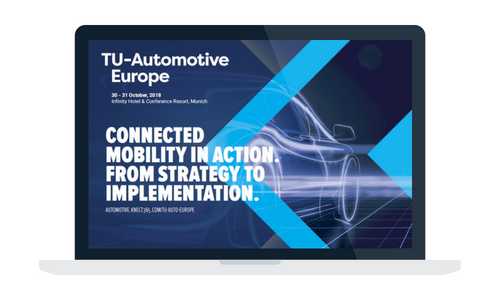 TU-Automotive Europe is Europe’s biggest conference and exhibition showcasing the future of the connected car and auto mobility. Complete the form on this page to reserve the brochure for 2019’s show. In 2018, 80+ industry leaders from CEOs & CDOs to start-ups – got the innovation and inspiration to fuel them into 2019 and beyond. We heard from leaders like Joly Benoit at Renault Groupe discussing "Customer Experience as one of the key new paradigm of the automobile", Lars Klawitter at InMotion Ventures talking about "Investing in the Future of Mobility– Adding value to the customer journey" and Tanja Neubert at Renault Nissan Mitsubishi Alliance exploring the "Digitalisation of OEMs: From Hardware to Software, UX and the new economy of the automobile". 600 attendees, 2 days, 1 location. Download the brochure to discover all the ways we are making it easier for you to get face to face with the people you need to meet. 45+ booths showcase best in class connected vehicle technology. This is the industry’s unparalleled benchmarking and BD forum. Save on booking your event ticket with a special discount code only found inside the brochure.